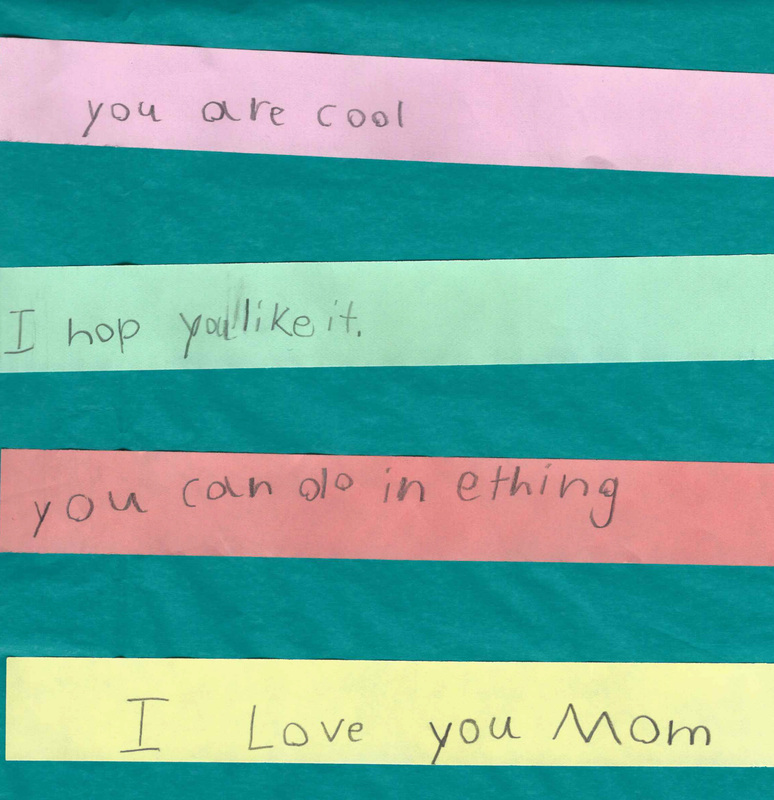 It’s Mother’s Day this weekend and instead of getting all maudlin and melancholy because it’s kinda the last “our little family” one, I decided to think about the things I love about mother’s day. Mom is just one of the hats I wear, but the one I have worn the most in the last almost 18 years so I guess it’s ok to sit back occasionally and see how it feels. I usually get taken to a wonderful garden for mother’s day. I remember plenty of them at Longwood Gardens in Pennsylvania and a few at the Huntington in Pasadena. But sometimes it has been kite flying at the park, or sandwiches on the beach. Small or elaborate, my perfect Mother’s day needs to include just a few things: I don’t cook, I don’t clean, and all four of us spend some time together. I believe my first mother’s day I asked for a card, maybe flowers, but frankly that was kind of a high bar for a husband that spent most of his days in the lab finishing his Ph.D. I have been perfectly content with the no-cook/no-clean version for a while. I was never one for presents, not on mother’s day at least, but I have always been excessively fond of tokens of affection. Handprint flower bouquets the kids brought home from school have always been my favorite. If both of the kids got together and made one with their now adult hands, I would keep it beside the one I got from my daughter when she was 5. I still have them all, the handmade cards, the decorated poems, the handprint hearts. They are some of the things I can’t get rid of no matter how much I try to declutter. One of my favorites is the little jar of sunshine the boy made for me in second grade. I have a sneaking suspicion that his teacher knew that when things got a little rocky in the teenage years, it would be lovely to have this little jar to look back on and remember the simpler times. She was pretty awesome that way. It’s so simple. 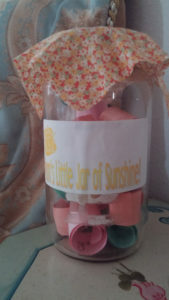 A clear jar, the lid covered in a cute floral print fabric and tied with a ribbon (now lost to the ages) and filled with a bunch of rolled up pieces of paper where he wrote things he liked about me, thank you notes, and other random things to make my heart smile. I’m pretty sure I laughed and cried the first time I read them. He could barely read and write in second grade so some of them took a while to figure out. What I really noticed at the time, however, was how hard he must have worked on them. Phonetic spelling aside, spaces between words and motor organization were things that he struggled so hard with in elementary school, the fact that they were as clear as they were indicated an intense amount of effort on his part. That he was willing to put in that kind of effort has always been the best part of this gift. Later, though, I realized that it was a coded message. Road signs to point me onto the path of being the right parent for him. I still look at them sometimes when I need some perspective, or reassurance, or even a laugh. I don’t cry as much anymore, but they can still get me teary eyed. I don’t like to be pensive about them so I usually come up with light translations that keep me grounded. And so I will share them with you in that spirit. Happy Mother’s day to all who are mothers or have mothers. You like foods I like: Meaning probably I usually cook things that he will eat, this made things easy for him and easy for me. You are good at remembering: I guess I used to remind him to bring his jacket so he could go out at recess. This one is actually pretty funny because about 20 minutes ago as we were on our way to an AP test, I stopped the car just past our driveway and asked if he remembered to bring his ID to get into the test. We had to turn around and go back to get it! I guess I’m still good at remembering things. You are nice: I probably had coffee that morning so I didn’t yell as I was rushing him to the school bus. You support me in school: This is when I still reminded him to bring his homework to school. You are a queen: Obviously, but not the Snow White queen or any Disney queen for that matter. Hmm, not much in the way of literary good queen’s either, definitely not Gertrude from Hamlet. Maybe I should just skip this one. You can do anything: Anything that he asks, at only 7 he didn’t ask much yet and didn’t understand the limits to my mommy super powers. Cuter still because he made “anything” 2 awesome words—in ething. 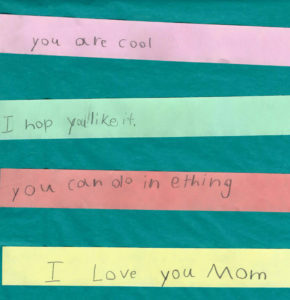 You are the best mom ever: Self evident. I belong to him, therefore I must be the best. You are funny: I laugh at his jokes, sometimes I even make funny ones myself. Q: where do cows go on Saturday nights? A: to the mooooooovies. You are good at cooking: I guess he likes my food. I love you mom: I start crying here. You are happy: I am actually, no joke about this one. He apparently likes to be around happy people. If this was all there was to motherhood, I would be golden. I hope you like it: Just a little validation goes a long way. Now I cry at this one, I wish I had paid more attention to it. You are a great cook: Again with the food. Either he was running out of things to write or his obsession with food was foreshadowing some problems down the road. I’m thinking the former. Thank you for taking me to dinner: Perhaps I’m not as good a cook as he thought? Thank you for helping me with problems: This is the time, before he becomes a teenager, when he thinks that my insights and opinions have some value. Either that or I brought him homework he left on the floor of his room. You get me things when I need them: I take him to Michaels at 8 pm to get poster board that he just that moment remembered he needed for a book report due tomorrow that he hasn’t started. This is still pretty much standard practice around here, although less so with school work and more so with everything else. You read me stories: Still my favorite part of being mom. You are helpful: No matter how often I deny it, I was his Sherpa and apparently he liked it. I have fixed this problem to a great extent, but sometimes he pretends he’s seven and asks me to do stuff. A lot of times I do. You read a lot: The reason for number 17 above. You cook good: Funny that he continues to go back to the one thing about “mothering” that I truly loathe. Is it validation when you are approved of most for the thing you like the least? You like things I do: I show interest in his interests. It’s that simple and it’s that hard. You help me when I cry: Compassion. My greatest strength and my biggest weakness. I hope this is always true. You are cool: Proof positive that at one time I was cool.